The Family Model Rides are back! And we're starting out with the Sportsters! 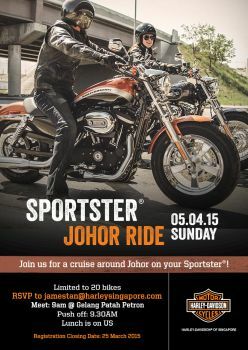 Join us for a cruise with your Sportsters on 5 April 2015. Limited to 20 bikes only. Meet 9am at Gelang Petah R&R Petronas, Push off at 930am.